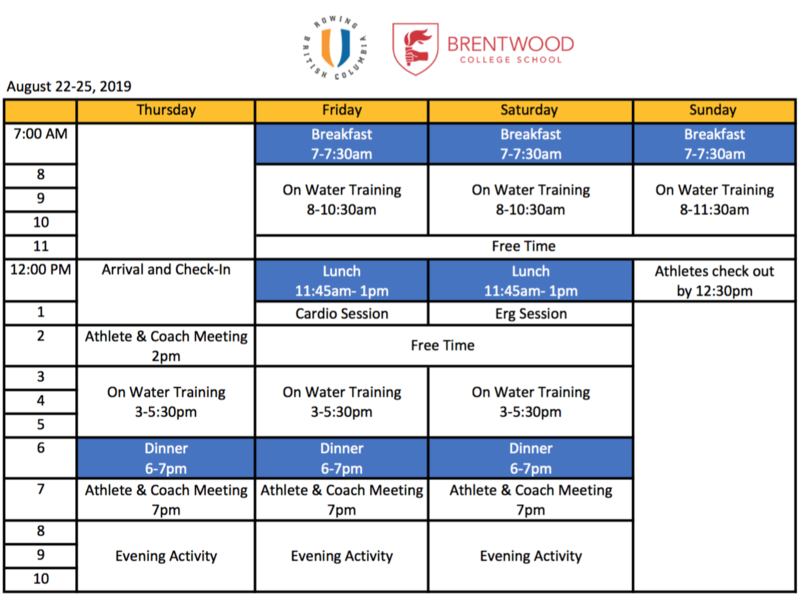 Rowing BC, with support from Brentwood College School Rowing, will be hosting a Development Camp at Brentwood College School August 22-25, 2019. This is an opportunity to train alongside other top performing athletes with similar performance goals. BC Summer Games Preparation Stream: Intended for athletes with the goal of representing their Zone at the 2020 BC Summer Games (must be either U17 or U19 as of December 31, 2020). This stream will be coached by Rowing BC’s Coaching Coordinator, Martin George, with support from the coaches selected as Head and Assistant Coaches for each 2020 BC Summer Games Zone from across the province. Athletes from all Zones are encouraged to engage in this early preparation opportunity to become familiar with the race expectations of the BC Summer Games, and with the coaching staff who have been selected. Canada Summer Games Preparation Stream: Intended for athletes with the goal of representing BC at the 2021 Canada Summer Games (must be U21 as of December 31, 2021). This stream will be coached by Rowing BC’s Provincial Coach, Rob Richards, with support from RCA NextGen HUB coaches and other coaches with Olympic experience. This is an opportunity to train alongside other athletes performing at a high level, and benefit from world-class coaching and facilities. University Preparation Stream: Intended for athletes wanting to freshen up before heading back to university rowing in September. This steam will be supported by RCA NextGen HUB coaches and other coaches with Olympic experience. This is an ideal preparation opportunity in the final weeks of summer for those preparing for the intense Fall university rowing season. The camp cost is all inclusive – covering coaching, equipment, meals, accommodation and workshops. Athletes are required to arrange their own transportation to and from the camp. Payment of $325 can be made by cheque mailed to Rowing BC (155-3820 Cessna Drive, Richmond, BC, V7B 0A2) or by e-transfer to admin@rowingbc.ca. For additional information, contact Rowing BC Provincial Coach, Rob Richards (rob.richards@rowingbc.ca).